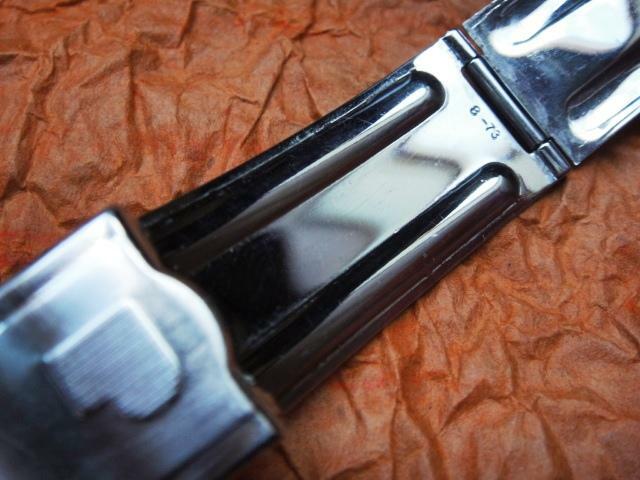 The "P2" is the first mass produced electronic display LED watch in the World. It was marketed straight after the very first LED the "P1" presented in 1972 by Pulsar Time Computer. Despite the market success of the gold P1's they were withdrawn back to the factory due to problems with Electro-Data modules and were fitted with a robust version developed independently by Pulsar. 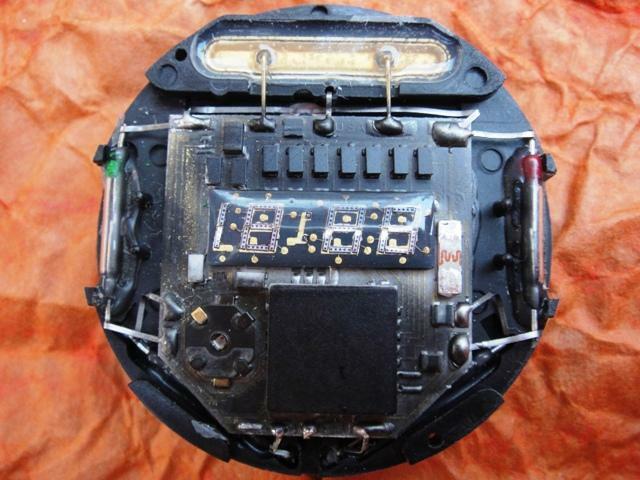 Thus P1's that exist today in an approximate amount of 40 (working) contain electronics from an early P2 (2925) adapted to fit the different plastic carrier. The P2 in stainless steel aka "Astronaut" was endorsed in 1973 by Roger Moore in the first five minutes of "Live and Let Die" from the James Bond 007 series. A gold-filled version was available as "VIP" as well as solid-gold in limited issues. 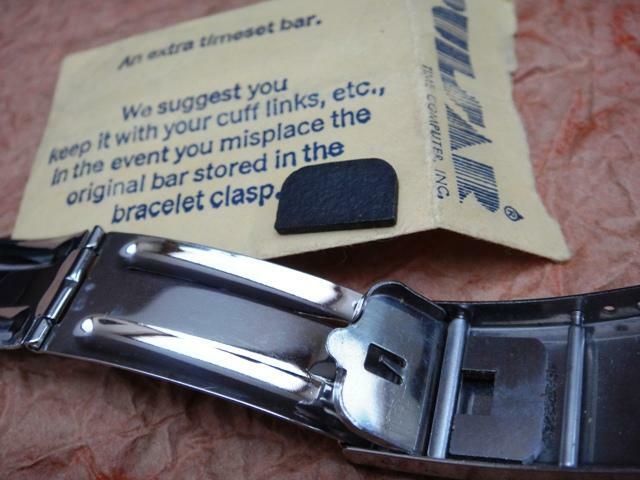 Most clasps contain a production code which helps to date Pulsars. 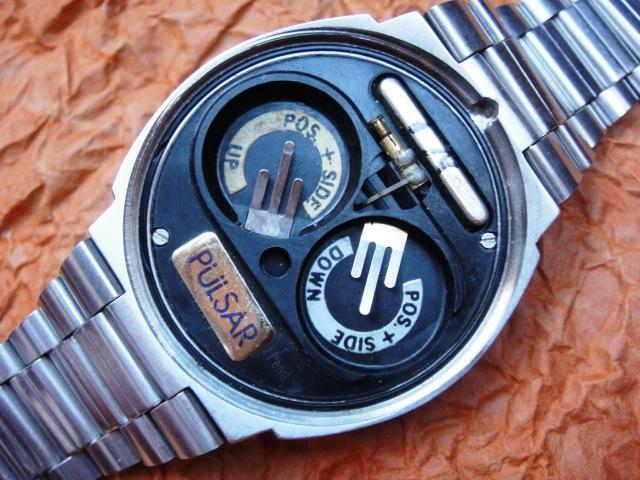 Pulsar watches as the first LEDs in the World were positioned as revolutionary top-shelf wrist-gadgets for the quality and technology oriented customers. 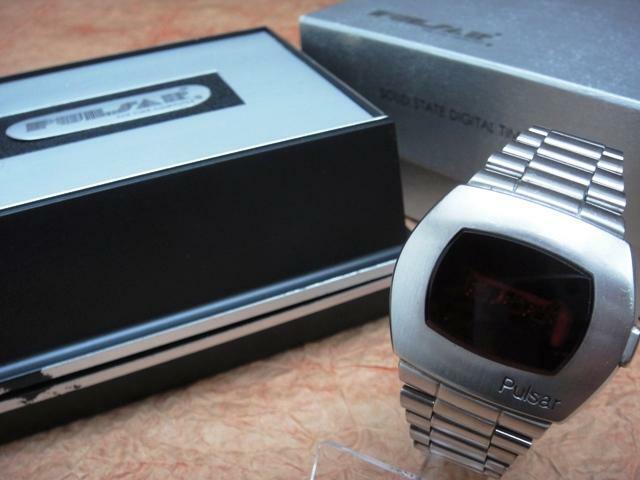 Pulsar was the first of a few digital-watch producers who offered solid-gold cases and even Tiffany stores ordered Pulsars with their own logo printed on the red crystal. 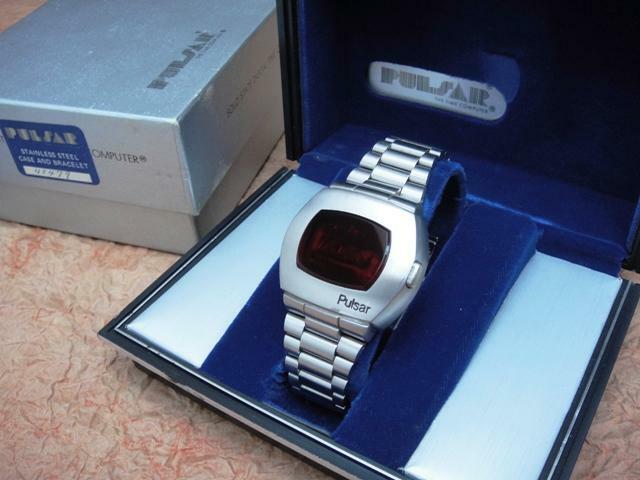 Pulsar never lowered the quality of their watches and the retail price for a stainless steel P2 was set at 295$ which was a lot of money back then. 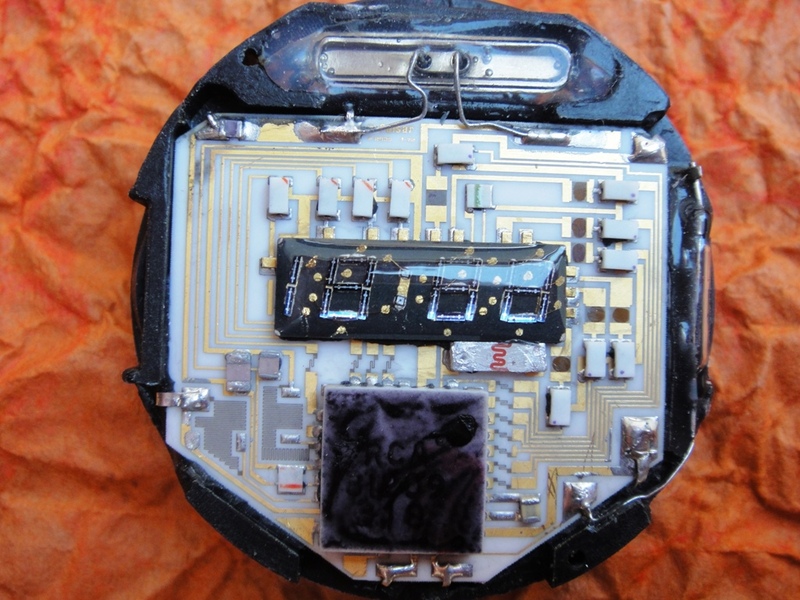 Light Emmiting Diodes by Litronix were one of the most expensive components of a LED watch and Pulsar never decided to cut corners and use plastic lenses to enlarge smaller diodes. 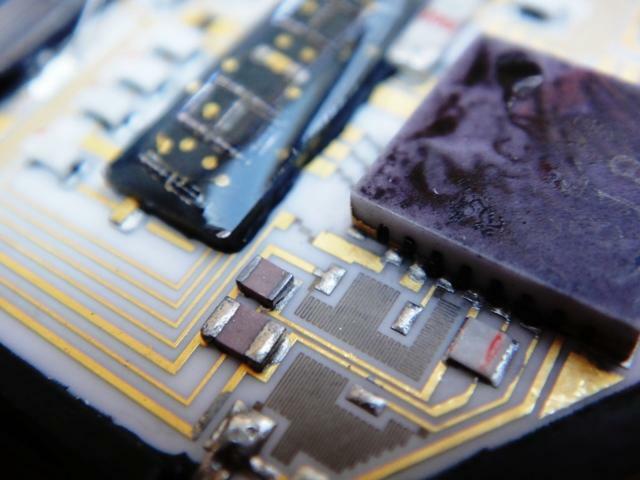 Quality and visibility of the LEDs was vital and thus displays were encapsuled in durable epoxy giving large and easy readouts. 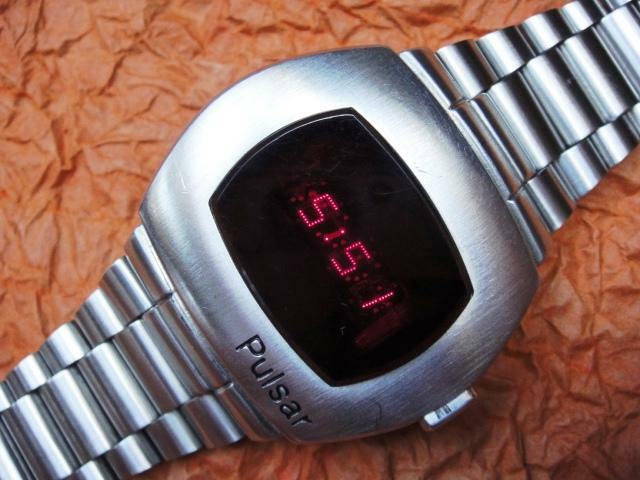 The cool dot-display was characteristic only for Pulsar watches until 1975 when segment/bar-displays became the standard. Dot-displays have been nick-named "dot-matrix" by collectors although it is not correct. The name was first introduced by Seiko in 1977/78 in the first true dot-matrix LCD displays that allowed to display all sorts of dot configurations presenting alphanumeric and animated figures. Very likely the "dot-matrix" phrase was used in LEDs due to the visual similarity and it stuck for good. 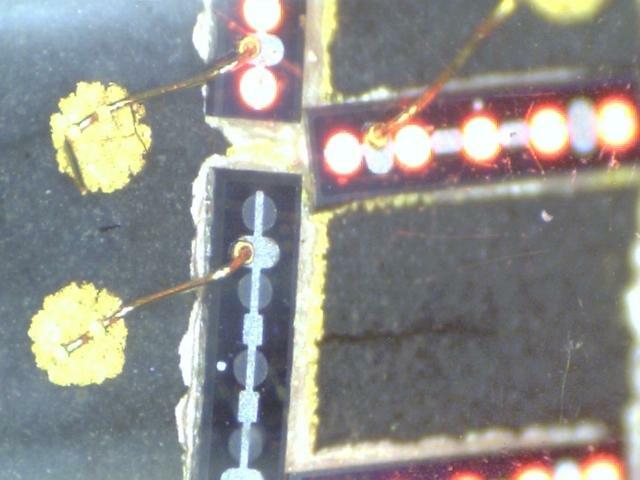 If you look closely at the 200x magnification (left) you can clearly see that the display is set up from small bars in which only small dots light up. This was very likely used to decrease power consumption. 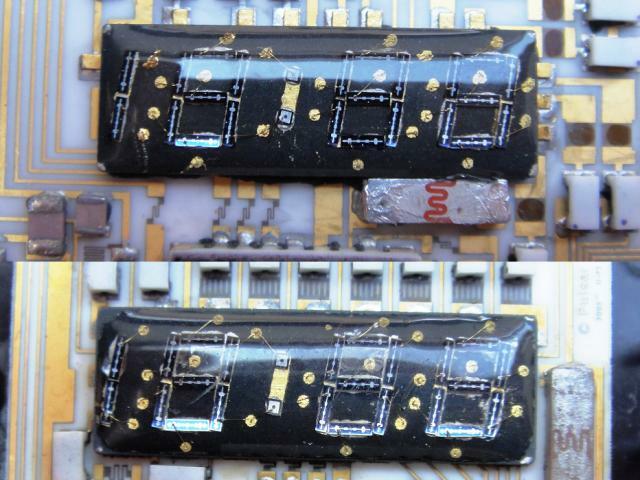 Each bar was manually applied to a ceramic substrate and fixed with conductive silver-epoxy and then wire-bonded under a microscope with fine goldwire. 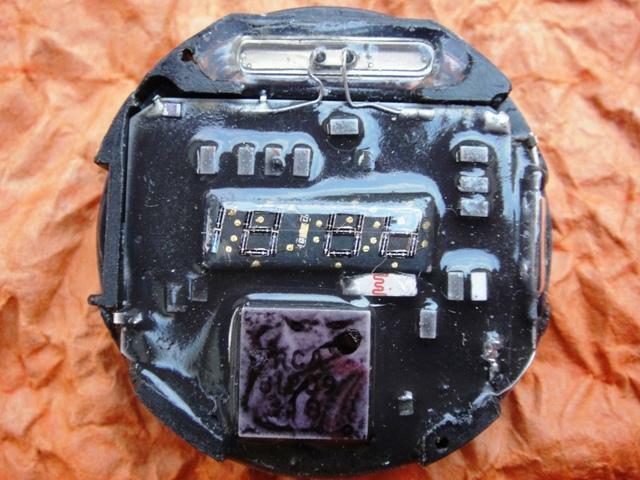 Everything was finally encapsuled in epoxy for protection and better visibility. 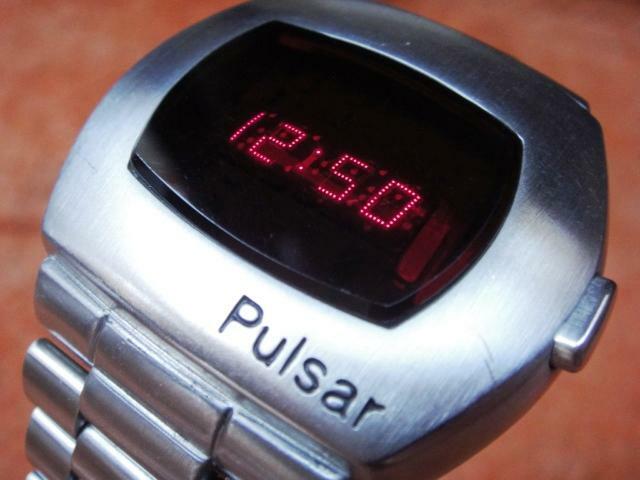 In comparison to other LEDs Pulsar watches feature an interesting concept for displaying and setting of time. 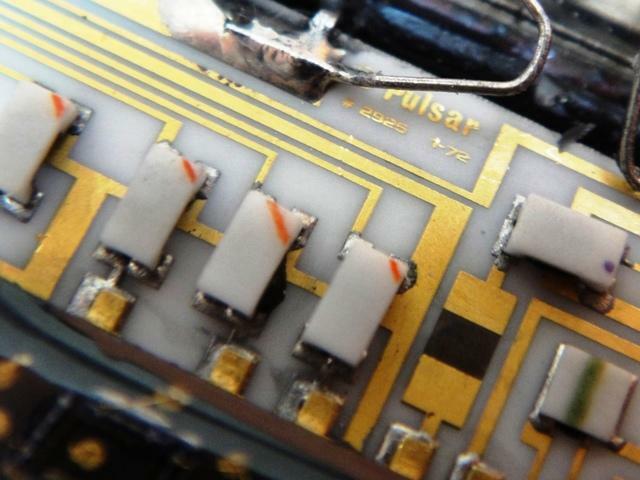 To create a perfectly waterproof case magnetic reed-switches have been used - tiny glass tubes with two wires inside. 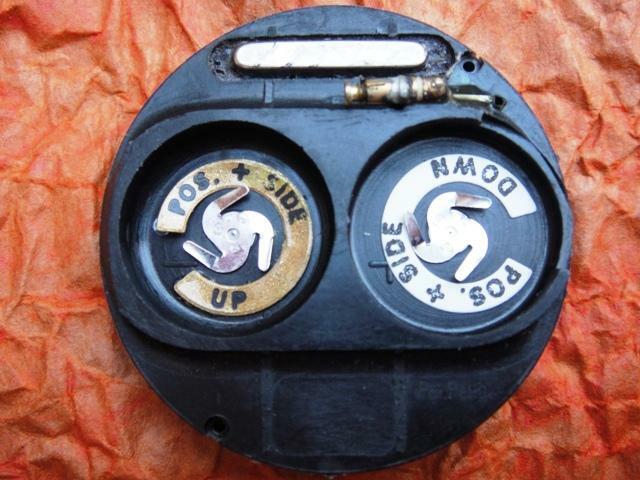 These are connected and close an electronic circuit once a magnet is attached thus the time-command buttons contain a small but powerful (spring-loaded) magnet fitted into a "cup" that is soldered inside the case (the first batch in 1972 had buttons closed with a flat plate). 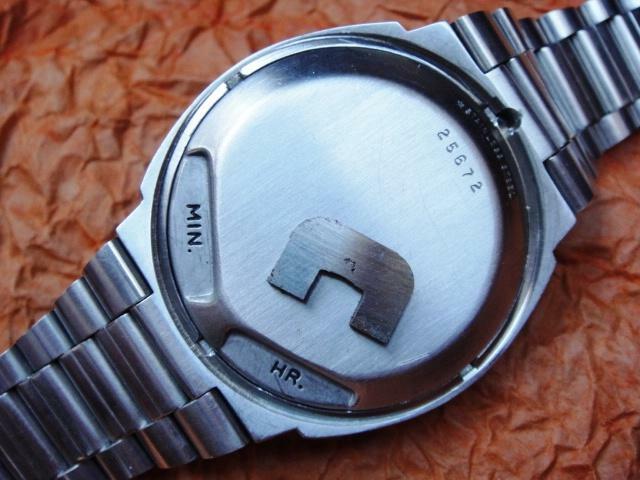 Time is set and advanced also by means of reed-switches by applying an external magnet (stored in the clasp) towards HR and MIN indentations in the caseback. This prehistoric technology was applied until 1976 however it enabled all Pulsars to obtain a higher degree of watertightness in comparison to other LEDs. 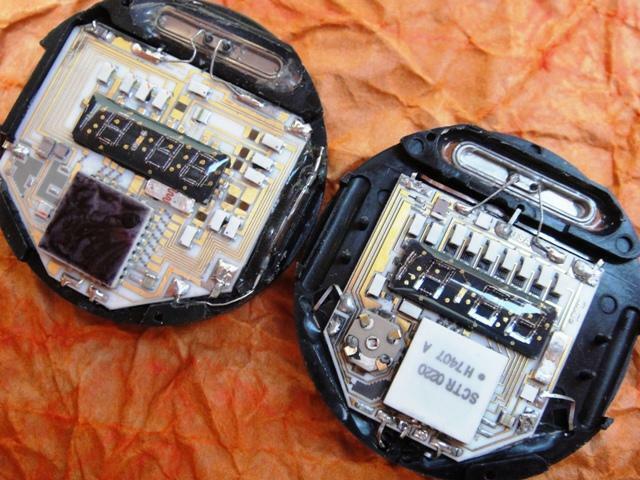 The P2 can be found with two module types that can be easily differentiated by the position of the light-sensor (white-orange) visible through the red glass filter of a Pulsar watch. Pictured to the left is the first generation module produced from the 3rd quarter of 1972 to approx. 2nd quarter of 1973. It has a bigger ceramic substrate, epoxy covered electronics, only one adjustment trimmer and propeller shaped battery springs. When the following P3 model was about to be launched in mid 1973 this rare early P2 module was upgraded to a P3 design in order to reduce production costs and unify parts for both the P2 and P3. 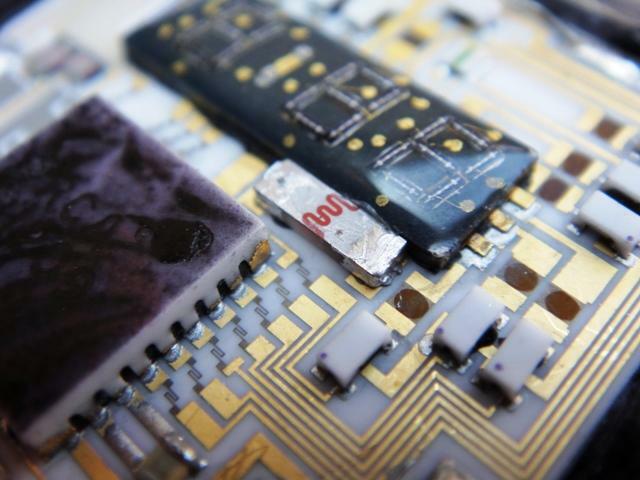 Thus the late P2 module is identical in appearance with the P3 but lacks the date function that was not programmed in the chip and has an empty space in the plastic holder to accomodate the date reed-switch. Despite some similarities between the early and late P2 generation be aware that both types differ with the construction of the circuit board and display outputs. 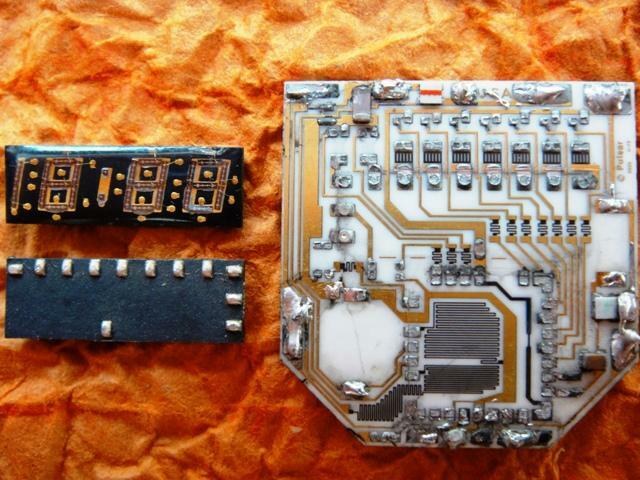 They are completely different and not interchangeable in terms of sourcing suitable spare parts. More details on display replacement and general Pulsar repairs will be described in the Repair section of this site (soon to come). 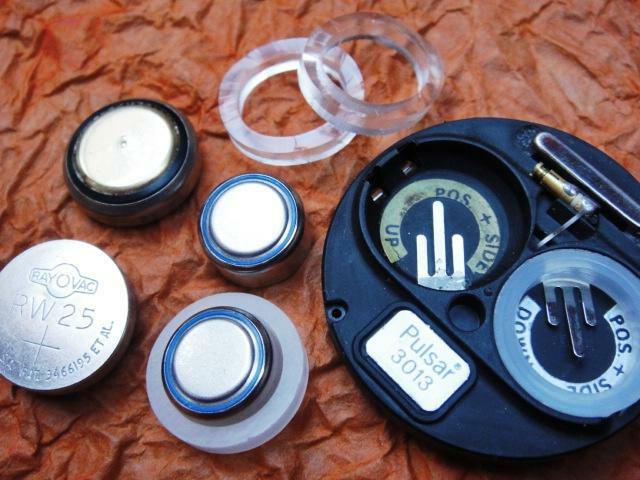 A common issue with Pulsars nowadays are the large 355 batteries that are no longer produced so many people sell their inherited Pulsars as untested. The best available solution are generic 357 cells with so called "spacers" that are sold online or can be made "free" from a slice of rubber pipe. The blue box shown below is the best original match for the P2 and is highly sought after. Some late 1974 versions can be found with some other brownish designs.